SHHHH! Movies that feature libraries or librarians. A tenant farmer's son is caught in the middle of owner-tenant disputes when he falls for the plantation owner's seductive daughter. Martha Lockridge: Whatever was the issue? A stubborn woman was fired. Your council blew itself up with civic virtue. The city got something to buzz about. I got a better job. You got a platform. Paul Duncan: You make it sound like a grab bag. Martha Lockridge: Well, what do you think it was? Patriotism? Bette Davis plays the title role and in fact she is the Storm Center of this film, a librarian who wouldn't remove a book from the shelf called The Communist Dream. Bette had the notion that those who want to should read the book and find out if it was a dream or a nightmare. This is one of Davis's best performances, one that had it been in an A film might have earned her another Academy Award nomination. Bette plays a World War I widow whose work is her life as a librarian in your average small town USA. The character is very close to the real Davis who remarked that work is the one thing in life that is stable and when done well, will give you more satisfaction and no pain than any relationship. A chance remark by her associate at the library, Kim Hunter to Brian Keith a city councilman she's dating sends the ambitious Keith off on a Red hunt. Keith finds out that she joined many do gooder organizations back in the day later labeled Communist fronts and together with the aforementioned book is proof positive that the Red Menace has come to town. There's also a subplot involving young Kevin Coughlin, a bright young kid who totally does not connect with his blue collar dad, Joe Mantell. Davis has befriended him, but when the stories about her start to circulate faster than the library books out, he turns on her most dramatically and sets the stage for the film's climax. If there was a special award that year for best performance by a child, Coughlin would have taken it hands down. Writer Daniel Taradash directed Storm Center in his one and only time in the director's chair, he should have done more. There are a lot of carefully done small performances in Storm Center showing a lot of small town types. Taradash carefully did his characters, there are no stereotypes as you might expect in a film like this. Two of Davis's most consistent supporters are café owner Joseph Kearns and minister Edward Platt. I liked Platt's performance very much, the minister is not some bible thumping right-wing clown, but a very intelligent man who understands what the Constitution and the First Amendment are all about. Paul Kelly has a nice performance here as well, one of his last. He plays a judge who is a decent man, but a guy inclined to always go along and take the easy way out. He's Davis's long time friend and he thinks he's giving her good advice in telling her to just go along with the majority wishes. Sad to say Storm Center is maybe more relevant today than it was at the time it was out. Back then it was a book called The Communist Dream, today it's Heather Has Two Mommies. All over America there are politicians like Keith looking to make cheap points exploiting prejudice. Storm Center is an underrated gem of a film, one of the best in Davis's career. There's an old adage in that when you talk about the Bill of Rights you're a conservative, when you actually try to put them in practice you're a radical. 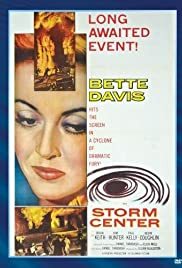 I've rarely seen that demonstrated better on screen than in Storm Center and the performances of Brian Keith and Bette Davis.